What is the period called the Last Days actually referring to? This question was put to me recently by Doug Harris from Britain's apologetics television program "Simply the Truth." 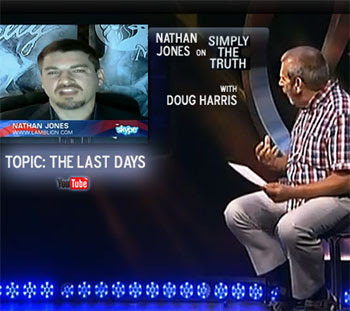 In this first episode of Doug's new show "End Times Truth," he sought along with me and other guests to define what the Last Days are and how we should live in them. The following is an excerpt of that program. Doug Harris: Is the Last Days the period of the First Century immediately after Paul was writing about the topic to Timothy, or is it pointing to some remote time in the future? Maybe indeed those days lie in the future. These among other questions I put to Nathan Jones of Lamb & Lion Ministries. Nathan, we began by looking at this whole introduction to end times by reading 1 Timothy 1:4, which we'll address more later. We then read about the "latter times" in 2 Timothy 3:1 and we also find the term "last days." Are these talking about two different periods? If so, what's the difference? And, where are we in the scheme of things? Nathan Jones: The best answer to your question leads us to the Parable of the Weeds which Jesus told in Matthew 13. This is the story where Jesus declared that humanity is coming upon a great harvest. A time is coming when the weeds, that is those who have rejected Jesus Christ and His salvation, will be rooted out. Also at that time the good wheat, which are those who are saved throughout history, will be brought into the barn, which means brought into Heaven. It's to be a time of reaping and a time of harvest. That same imagery Jesus uses in Revelation 14 which describes a great reaping upon the earth. We can go back to the Old Testament and read that the prophets often used the key end times term "latter years." For example, we can find it used in Ezekiel 38, which also uses the term "last days." Jeremiah 37 cross-references those days when he talks about the "time of Jacob's trouble." We can also find in the New Testament the same terms "latter days" and "last days," but those texts also call that time the "Day of the Lord" in Acts 2:20 and 1 Thessalonians 5:2. From these scriptures we know that in the "latter years" there will be a time of reaping and harvest upon the world, and we can specifically attribute that time to be the Tribulation. The Tribulation is a seven year time period that will befall the human race and scourge the entire planet. It will be a time beginning soon after the Rapture which has taken the Church up to Heaven beforehand. The people on the earth will be left to experience 21 terrible judgments for the purpose of trying to get them to turn their hearts to God and give their lives to Jesus. The specific focus of the whole reaping is targeted on Israel, because God wants a remnant of the Jewish people to accept Jesus, also called Yeshua, as their Savior. Now, when we talk about the "latter days," it can also refer to the days leading up to the Tribulation. That means the Church Age, which Revelation 3 describes and which we are living in right now. The last of the seven churches Revelation describes is the Church of Laodicea. It's the apathetic church that defines our very time period in Church history. So, in summary, the "last days" and "latter years" specifically are about the seven year Tribulation, but they can also generally refer to this Church Age which is the final phase of human government before the Messianic Age is ushered in by Jesus Christ's Second Coming. Doug Harris: Very interesting! So, there are two periods of time described there. We've got the "latter day," which obviously takes a period of time to reach, but then there's the actual end of those days. Are you saying that we are now living in that period of time towards the end of the "latter days"? Nathan Jones: I believe so. When we read Luke 21 and Matthew 24, Jesus is describing what will be going on in the "last days" or the "latter days." We also read in Revelation 3 how the end of the Church Age which we are in right now is defined by the Church of Laodicea, again known for its apathetic and weak faith. Laodicea is Christianity watered down and weak and very apostate, which we call can see clearly is the case and sign of the times. Back to Luke 21 and Matthew 24, Jesus said that human morality would get to the point as it was in the days of Noah. Before the Flood in Noah's days, people did whatever they wanted to. They were totally evil except for Noah and his family. Jesus said when we see humanity return to the days of Noah, or the morality of Noah's time, that would be an indicator that the world was in those last days. That coincides with the Rapture of the Church which must happen before the judgments of the Tribulation befall the earth. So, while the actual definition of "last days" and "latter days" can apply to the Church Age we are living in as Jesus describes it, I would add that the culmination of the last days is the final seven years of human government, which is the period of the Tribulation. Doug Harris: Whenever the "latter days" are specifically, the point is that we are living in them now. Many do seem to really believe we are living in the end of the "latter days," though not necessarily the Tribulation. In the second part of this interview on End Times Truth, we will discuss how we can avoid deception in these last days. YouR end time scenario is wrong !! Where is Dan 7 beast/kingdom 'diverse from all others' AKA islam? Go teLl the Christians & Jews being slaughtered since Stephen was stoned and continues unabated today, that some future date will be 'tribulation' !! Wake up & smell the jih@d !!! This is a non-essential issue, why can't we have different views/opinions about it, without having to wage war against our brothers (and sisters) in Christ?